A gasoline pump is used to dispense gasoline into motor vehicles. The gasoline pump evolved from a simple mechanism into a more elaborate, specialized one as automobiles grew popular. When cars were rare, drivers usually filled a canister of gas from a barrel or tank at a hardware store, and then tipped the canister into the opening of the car's gas tank. This process was inconvenient and messy, and possibly dangerous, as the gas could easily leak or splash from the container. The first pump specifically marketed for gasoline was adapted from a kerosene pump designed by Sylvanus Bowser of Fort Wayne, Indiana. Bowser had come up with his kerosene pump in 1885, and when he brought out the gasoline version—the "Self-Measuring Gasoline Storage Pump"—in 1905, he was still somewhat in advance of consumer demand. 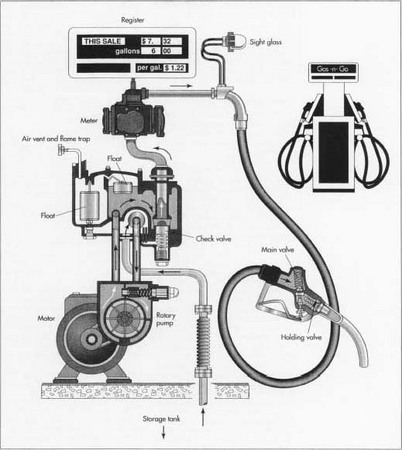 Bowser's invention operated with a manual suction pump, which dispensed the gasoline into the car through a flexible hose. The 50-gallon metal storage tank housed in a wooden cabinet could be set up at the curbside in front of a store. A slightly earlier invention was John Tokheim's 1901 glass-domed pump for gas or kerosene. The gas was pumped from a storage tank up into the dome. The consumer could measure the amount visually, and then release a valve to let the gas down a tube and into the gas tank. One advantage of this pump was that the consumer could inspect the gas, and make sure that the vendor had not adulterated it. Watering down was apparently a common problem, especially when the gas was stored in an underground tank, out of sight. By the 1920s, many manufacturers were producing gas pumps similar to Tokheim's and Bowser's. Common features were hand-operated pumps, glass-dispensing areas, dial gauges-often of questionable reliability-and a globe-shaped head on top of the pump, bearing a logo. Gasoline itself was often not brand name, but supplied by small dealers and distributors. The pumps were gaudy and decorative, boldly declaring their brand name, and drivers seemed to pick their preferred filling station by the pump and not by what it dispensed. This reversed by the end of the 1920s, when gas became a branded item sold by large companies such as Shell and Gulf. The first electric gas pump came out in 1923. Further refinements to pump technology mostly concerned how the amount of pumped gas was indicated. As the glass globe was abandoned, consumers needed some other way to tell how much they were buying. One model used a dial with revolving hands similar to a clock to indicate gallons dispensed. In 1933, a Fort Wayne, Indiana, manufacturer brought out a pump with a mechanical calculator called a variator. The variator used a revolving number wheel to show how much gas was being pumped, while a second wheel displayed the price. This was the forerunner of the system in use today, which makes it easy for consumers to buy five dollars worth of gas without having to calculate fractions of gallons. The inventor of the variator, the Wayne Oil Tank & Pump Company, licensed its technology to most other pump manufacturers, and by the end of the 1930s, the revolving wheels were standard across the country. The Tokheim Company, which had brought out one of the very first gas pumps, introduced the variator's successor in 1975-electronic measurement. Instead of wheels that turned, and interior electronic device calculated the amount and price, and displayed this information on a small screen. Today's pump uses virtually the same system, except that many pumps can also handle other sophisticated transactions, such as debiting the user's bank account. There are three basic systems in every gas pump: the hydraulics portion, which includes the actual pumping device; the electronics; and the frame or housing. The hydraulics are generally made from cast iron or cast aluminum. Synthetic rubber may also be used in the hydraulic segment, for seals and gaskets. The electronics portion may use printed circuit boards and plastic parts. The outer housing of the pump is generally made of sheet steel, or stainless steel. Gas pumps are generally manufactured on a semi-custom basis. That is, though many parts may be virtually the same from pump to pump, the manufacturer designs some aspects of the pump to accord with particular customer wishes. The number of hoses and where they are placed may vary, as may the type and sophistication of the electronics and the design of the housing. Before the manufacturing process begins, engineers must draw up the specifications for the particular order. Customized sub-assemblies may have to be ordered from suppliers, and machines may have to be re-set to cut parts according to the design. 1 The electromechanical devices that actually bring the gas from its storage tank to your car are usually made from either cast aluminum or cast iron. The iron or aluminum is melted and poured into molds, then allowed to cool. Workers then remove the parts from the molds and clean them by abrasion. Other parts may be stamped in a die. Sheets of metal are fed into a machine that punches out a piece in the desired shape. Metal tubing is placed in machines that bend it according to specifications. Workers using welding irons assemble smaller pieces into larger ones. In making the hydraulics, groups of workers trained in a few specialized skills work together in a cell—a unit of perhaps four to 50 workers—to produce parts that are consistently high quality. Each cell makes specific parts, and the parts are then passed on to other cells that specialize in assembling the parts in order. 2 The electronics for a gas pump control the display that tells consumers how much gas is being pumped and what the cost is. Many pumps also have electronic scanners that can read credit cards and debit the customer's account. These devices are micro-processors similar to those used in computers and calculators. The electronics manufacturer produces these by running small, stiff pieces of non-conducting material—typically cardboard or ceramic-through a solder printer, which imprints a pattern of circuit paths on the board. Other parts are placed by hand or automatically, and the board is heated in an oven. The oven melts the solder paste put down by the solder printer, forging electrical connections. The gas pump manufacturer might not do any of this, but buy the circuitry according to specifications. Workers at the gas pump plant may assemble the electronics by snapping or soldering pieces together. These workers, like the hydraulics workers, typically would be assigned to a cell responsible for the head of the pump. A typical gas pump mechanism. 3 After the hydraulics and electronics are completed, workers bring the parts over to the housing area of the plant. Here, doors, panels and outer walls are cut from sheet steel. These are then sent to a painting area. Workers apply a high-quality, corrosion-resistant paint to the housing, according to a design specified by the customer. The painted parts are sent through an oven to dry, and then cleaned. Next, the hydraulics are fitted to the electronic head, and the whole pump is encased in the housing. Hoses are attached, and gaskets or seals applied. The sections of the housing are welded together, or attached with hinges. The unit is cleaned, and the paint may be touched up. Next, the unit is inspected and tested, then sent to the customer for installation. Workers inspect gas pumps for quality at many steps along the manufacturing process. If parts are ordered from subcontractors, these are tested and inspected on arrival at the factory. Raw materials, such as the steel for the housing must also be inspected to make sure it is the proper gauge, and free from irregularities. Quality-control inspectors visually check pieces as they come off the assembly line out of the cells. When the entire hydraulics portion of the gas pump has been assembled, it is tested for leakage. Water may be run through it, or pressurized air. Any leakage would be extremely detrimental to the operation of the pump, so great care is taken at this point in its construction that it is absolutely leak free. Similarly, when the electronics portion of the pump is fully assembled, it is tested for accuracy. The weights and measures in the pump must be calibrated exactly. After the entire pump is assembled, it is tested again. One test is a running test, where the machine is put to use for a certain number of hours or days, and checked for any faults, particularly leaks. Quality control inspectors also administer what is called a dielectric withstand test. In this case, a high voltage current is run through the wiring. Any flaws in the electrical system are made evident by this test. Each gas pump maker tests its own products, because the manufacturer wants to assure its customers of a high quality product. Outside inspectors working for Underwriters Laboratory, an agency responsible for a variety of electrical products, also run tests on gas pumps. Pumps that use radio frequencies to identify vehicles also come under the jurisdiction of the Federal Communications Commission (FCC), which administers its own tests. Current innovations in gas pump technology focus on three main areas. One is meeting increasingly stringent environmental standards, especially by detecting leaks and containing vapors. A second area where new technology is being applied is data collection. This means automated systems that can check a vehicle's odometer, and record how much fuel it uses, providing convenience for vehicle fleets such as those owned by trucking firms, police forces and bus companies. Perhaps the most fascinating new gas pump technology is the robotic pump that fills the gas tank while the consumer sits in the car. A variety of devices are being developed to recover vapors lost when gas is dispensed. Some are placed in the hose and others in the nozzle. The challenge is to prevent vapor leaks without slowing down the rate at which the gas can be pumped. The newest high-tech nozzles contain electronic sensors, which record vapor and liquid leaks, and automatically shut off the pump if the gas tank becomes full. New technology is coming into play for owners of fleets of vehicles. An experimental system is in use in some parts of the country, where the gas pump nozzle can read information from a device installed in a vehicle's fuel tank. Two loop antennas, one in the nozzle and one in the tank, communicate by low-frequency magnetic induction when they come in contact. As soon as the driver begins fueling the car, the antennas connect, and begin sending information from an electronic unit mounted in the car to a terminal at the fueling station. The system can record which vehicle in the fleet is being filled, how much gas it is getting, how much the gas costs, how many hours the car has been driven, and what its odometer reads. This can cut down significantly on the paperwork needed to maintain a large commercial fleet. Similar technology is also being tried out for individual consumers. The consumer uses a small radio-like device, which can be hung on a key chain, carried like a card in a wallet, or mounted on a window. The gas pump carries a similar device that emits a low-frequency radio signal. When the consumer drives up, the gas pump reads the card or tag, identifying the customer and debiting an account for the gas bought. The first fully robotic gas pumps were tested on consumers in 1997. To use the robotic pump, the consumer needs a transmitter on the vehicle's dashboard and a specially modified gas tank cap. The driver parks the car by the pump and enters the amount of gas needed on a keypad similar to the keypad of an automatic teller machine (ATM). The pump reads the vehicle's make and model from the transmitter, and a robotic arm then finds the gas tank and opens it with suction. Then the robot inserts a nozzle through a flap in the tank cap and dispenses gas. The whole fill-up process is supposed to take only two minutes. Because this process requires drivers to have two modifications to their cars—the dashboard transmitter and the special tank cap—use of the robotic system may evolve slowly. Witzel, Michael Karl. The American Gas Station. Motorbooks International, 1992. Emond, Mark. "Drive-by Dispensing." National Petroleum News (November 1996): 47-50. LeDuc, Doug. "Indiana Gas Pump Maker Invests in Advanced Leak-Detection System." Knight-Ridder/Tribune Business News (August 26, 1997): 826B0903. Shook, Phil. "Pumping Out Innovation." National Petroleum News (January 1994): 32-36. Witzel, Michael Karl. "Gas Pumps." American Heritage of Invention & Technology (Winter 1997): 58-63. I just want to know and want to learn how to integrate a device or a program to any gas pumping machine to a computer system. The concept is that, before the machine dispense gasoline the cashier should first press a button to activate the machine. That is the Cashier in the booth or in the office should always have the full control to validate whether to dispense or not. Hope I will learn something from you friends.